This is a distinct question from Is the "Lookup in Dictionary" context menu option hardcoded in Google Chrome for Mac? I know this isn't what you want to hear, but maybe you should switch to command + c to copy if you want to avoid it. Thats what I migrated to and I almost forgot "Look Up" was even there. It'll eventually become a reflex. This is not really an answer as much as a workaround. Get more practice using Command-C. I work I.T. and inherited this Mac from my predecessor--and I'm still not a huge fan after four years. I now realize what I once despised is more of a square peg than a pile of junk. Learning what can be supplanted or bypassed has brought me a long way, and I've found much to appreciate about Macs and OSX†. One thing I actually like is this "rapid dictionary" feature, "look up X" in the context menu. When I'm 95% certain I'm about to use a word correctly in Gmail or a forum, confirming is a great deal faster here than opening a new tab to type dictionary.com/browse/X. My mousing accuracy isn't what it once was (pre-fatherhood gaming marathons), but as a geek I've long held that the keyboard is nearly always faster anyway. I use Linux at home, and I still support a million Windows boxes, so I frustrate myself with my new propensity to hit Alt-whatever due to my Cmd-C habits. Of all the things I've maligned in my adjustment curve to OSX and its related walled garden frustrations, this is one of the few things I've observed with, "huh--that's kinda neat." † I'll always prefer Linux to a Mac, but this is pretty solid hardware I must admit. Not the answer you're looking for? Browse other questions tagged macos google-chrome contextual-menu . How to disable “Look Up” context menu across macOS? 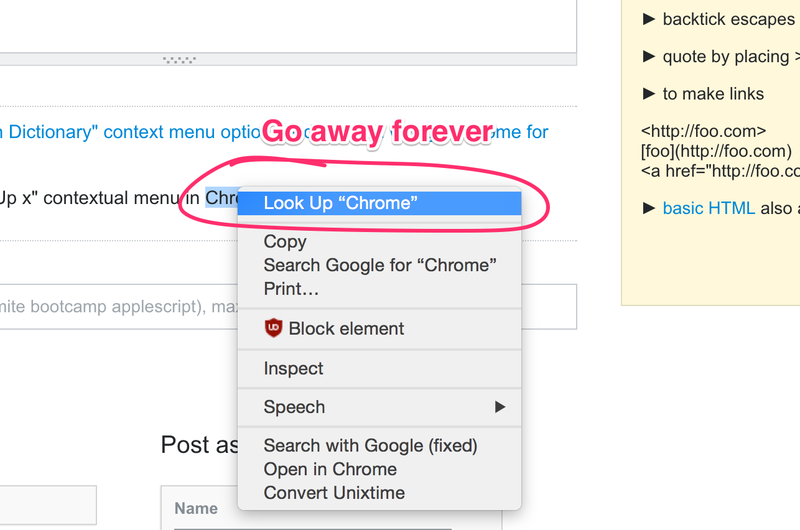 El Capitan : How to disable Force Click “Dictionary Pop-ups” in Chrome?